Can you smell that? It’s your brain burning. Enter the world of Enigma and put that grey matter to the test! 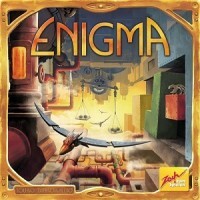 Enigma is a tile-laying game with a twist. Players choose a tile seeking to connect powers cells of the same color to score points. However each tile is also a puzzle that must be solved to be placed. If players solve the puzzle then they win the right to place the tile, expanding their system of power cells and potential points. Fail to solve the puzzle and you must discard your tile. When one player reaches 15 points, the player with the most points wins. There are four different sets of tiles in the game; each a different type of puzzle: Weight puzzle, Fragment puzzle, Conduit puzzle, and the Angular piece puzzle. These puzzles and tiles are the primary components of the game as they will form the developing game board as the tiles are laid out. Sort and shuffle all the tiles that share the same puzzle icon on its front and place them on their matching “puzzle chambers” puzzle side down. Also grab the matching puzzle pieces and place them on the illustration on the same chamber cards. The one starting tile is placed in the middle of the table. Next, each player chooses four Networker pawns of the same color and places one on the “0” space on the scoring wheel. Place the sand timer in the middle of the table give the youngest player the Starting Player pawn and get ready to fire up those neurons! Enigma is played in a series of rounds. Each round has four steps: Choose a puzzle, solve the puzzle, place your tile and then score any closed conduit systems. Beginning with the first player, each player chooses an Enigma puzzle to solve. You can see the power cell and conduit system of the top tile on each puzzle chamber, and of course you can choose the type of puzzle you wish to attempt. Take the tile, keeping it face down, and the matching puzzle pieces for that puzzle type. Once all players have a tile in front of them and feel they have wiped the cobwebs from their brains, we move on to the next step. Weight Puzzle: This puzzle card depicts a scale with two cups on either side. A number below the cup denotes how much one token weighs when placed on that cup. You must place tokens on the cups so that the total weight is equal on both sides. (Essentially making the total sum of the value of the numbers match on both sides). Conduit Puzzle: Place the conduit pieces on the available spaces so that all the conduits are connected or closed. In some puzzles, some of the pieces are not used. Angular Piece Puzzle: Perhaps the most challenging: the 3 dimensional pieces must be connected so that when looked at from directly above they match the illustration on the puzzle card. Tough thing here is, there can’t be any gaps or spaces between the pieces. Not so fast! If you did not solve your puzzle you must place it back in the game box, fold your hands and wait while the smarter players place their tiles. The real kicker here is there are no solutions. If you fail to solve your puzzle you don’t even get the satisfaction of knowing how close you were to the right answer. Man, this game punishes. But let’s say you solved your puzzle. Clever you! Flip the tile and again in player order you can connect it to any face up tile already in play. In doing so, you can create a longer conduit or cap off a conduit. The conduit system then can either be open or closed. Immediately after placing your tile you may place one Networker token on one power cell on the tile you just placed. But only if that conduit system doesn’t have another networker on that same color power cell. Finally, any closed conduit systems are scored. If you closed a conduit, you score one point for each power cell in that conduit that has the same color as the power cell where your networker pawn was placed. Track your score on the scoring wheel then remove all your networkers from the closed conduits. If no one has reached 15 points, the game continues. Players return their puzzle pieces to the puzzle chambers and the start player token is passed to the left. And a new round begins. If however a player has reached 15 points the player with the most points wins. Production quality for the game is very good. The main components: the puzzle tiles are a good thick cardboard that will hold up to multiple plays (and from being thrown across a room in frustration.) The graphic work on the conduit sides of the tiles is unique , creating a cool look to the table top. There is not a lot here, but it’s exactly what’s needed. Low. Learning how to play the game is snap of course, (like saying all you need to do to solve a crossword is “fill in letters”). But the dual challenge of puzzle solving, along with a strategic choosing and placement of tiles to maximize points does take a few games to get the hang of. You can jump right in but may walk away frustrated. Perfect for the family gamers. The game is listed as ages 13+ but really puzzles like this are so subjective. It’s always a wonder how quickly and easily young minds “see’ solutions to puzzles. Try it with as young as age 9 and you may be pleasantly surprised. The intense quiet as players’ brains fry while puzzle solving will kill any party or social feeling you hoped to have. Not too puzzling a decision. Although the .game does offer a strategic element in placing your Networker, the game focuses around puzzle solving. The puzzles and tiles are randomly distributed so you have less control over the difficulty and potential scoring value than most strategy gamers would like. Pass on this one. As heavy as the brain work can be in the game it’s really a light game. Plays in 30-45 minutes, easy to jump into, and great replay value. (Again there are no solutions to the puzzles)! Highly recommended as a casual game. Avid gamers will enjoy this unique experience but only if you are the sort of gamer that enjoys puzzles. It’s the main focus of this game and if you give up on a Sudoku after 10 minutes , run the other way. However there are some great “take that” moments in planning out your scoring strategy It’s a unique experience to be sure. This is more an abstract strategy game and well, it is quite challenging. It tests you, teases you and when you finish you feel like you want to throw the game off a roof. (if you didn’t win that is) You go head to head against your opponents’ brain power, against a timer and you must test yourself against the games hundreds of puzzles. Is this the sort of game that Power gamers like? I’m puzzled! Enigma is a great surprise. Certainty it’s an abstract strategy game at its core. Pawn placement on colored power cells and strategically closing off conduits determines your score round by round. But you have to make a picture of a duckie to do so! Tile laying and route scoring ala Carcassonne combined with a Cranium –like action phase. Does this make it a great game? It depends on what sort of person you are. There are people who enjoy puzzle solving and those who don’t. Even so, if you aren’t a puzzle aficionado, this game offers you a choice in several puzzles that you may excel at. There’s the mathy puzzle , the visual acuity puzzle, the three dimension spacial test and the visual logic test. The only thing you don’t have to do is draw or answer trivia. (Thankfully). Choosing your puzzle is important but is countered with the reality that you may need to deviate from your strong suit because of the colored power cells you need to maximize your score. You may have to choose math over tangram to get that one green power cell that will cap of your conduit route and give you a big score. Like many games it offers the chance to play it safe for a more assured scoring opportunity, or risk failure for the greater reward. So if the word puzzle scares you, don’t turn tail just yet. Enigma offers a great balance – playing to your strengths and forcing you to overcome your weaknesses when it comes to your intelligence. Another unique feature of the game is the fact that it operates in two distinct game play experiences. In other words, it’s “thinky” in two very different ways. The first of course is the puzzle solving. After a bit of banter and indecision, the puzzle tiles are flipped and the tension and silence are so thick you can cut it with a spatula. Then you hear the flip of the timer and sweat begins to drip of your eyebrows. Finally, time is called and the next phase of the game begins. If you solved your puzzle now you must look at the tile you chose and place it, and possibly a networker, to create the best score possible; taking away opportunities from other players or having them taken from you. You have to be reactive and tactical but definitely be planning ahead to the next round. It’s a good mix, moves quickly and changes from game to game thanks to different tiles that are available in each game and… did I mention that you don’t get the solutions to the puzzles!? Ghah! Touko Tahkokalio has created something that hasn’t existed yet: a great mix of two very different play styles making it accessible and challenging with an almost artificial intelligence that inspires revenge with every lost game. I’m not really sure what this means. But it’s not necessary. This game is IN your head, and at times IN your face and because of its amazing challenge and unique game experience it should be IN your collection. Problem solving is done simultaneously in four different categories — tangrams, block-stacking, canal-building and balance problems — and those who succeed expand the temple with the problem tile they solved, thus adding a new chain of rooms inside the temple or extending an existing chain of rooms. After placing a tile, a player can occupy a room on that tile with one of his three archaeologists as long as no other room of the same color is already occupied in that chain. When the chain is closed — that is, when the chain has no "loose ends" that can be expanded upon — any archaeologists in that chain's room return to their players, and players score 1 point for each archaeologist they receive. The game ends when somebody reaches 15 points, and the player who has the most points wins. Add a Review for "Enigma"